I was recently introduced to volume profiling (Similar, but not to be confused with Market Profiling); a charting methodology that displays price movement but also the volume that occurred at that particular price. I’ve seen several traders use volume per bar in their trading to try and find how strong a trend is, along with when the market is exhausted. Viewing volume per price level attempts to use volume in a very different way. The underlying theme for Volume Profiling is that the market is an auction. When prices are at a level that no one is willing to buy or sell at, price will move until we find prices where buyers and sellers are willing to do business. For example, at an auction if a car is being auctioned off and the auctioneer starts the bidding at $10,000 but no one enters, he will lower the price until someone steps in and bids on the car. Then other buyers will step in and bid the price up until no one is left and the car is sold. The market is similar in that there are many buyers and sellers looking to do business. Thus the price levels where more volume was transaction would be considered where the market considered prices to be “most fair”. The market will then move up and down based upon the number of buyers and sellers entering the market. Here is a picture of a volume profile for a 987 tick chart of the ES on May 31, 2012 (Charts by NinjaTrader, Volume Profile Indicator by RanchoDinero). The volume profile displays the amount of volume transacted at each price horizontally. The volume offers some very interesting information in addition to just price; first you can see where the majority of volume transacted over the course of the day. Second, you can see where prices had very little to no volume. Third, you can see the distribution of the volume over the day. This information all offers use insight into what the buyers and sellers are doing. 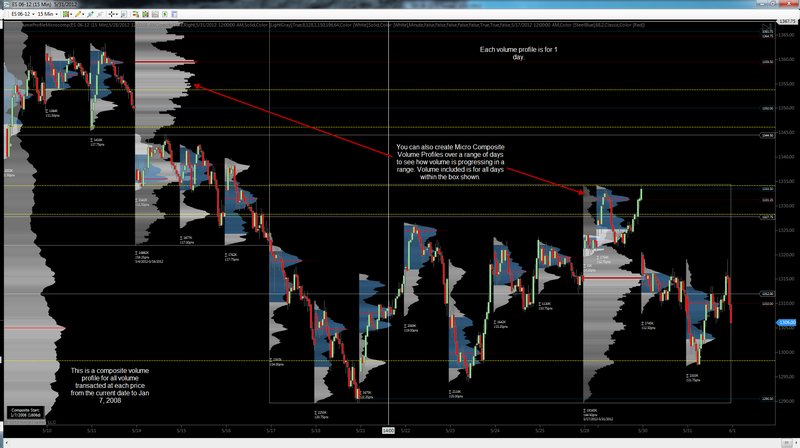 Volume profiles can be created across any timeframe that you want; Daily, Minutes, Ticks, etc. This allows you to see how the short-term volume is reacting against longer-term profiles. Here is a screenshot of daily volume profiles, micro volume profiles (custom range profiles) and a composite volume profile (Long term) of the ES in May 2012. This shows a lot more information you wouldn’t get with just bar charts. In particular on May 17 and 18, the market was headed downward but the VPOC was still in the higher part of the daily range. This can warn you that prices are not being accepted at lower prices as they are at higher prices, and there is the possibility of a short-term rally, which we got. VPOC or Value Point of Control: This is the price in the profile that has the highest amount of volume. This is the point where buyers and sellers transacted the most volume and thus the price that was considered most fair. Value Area: The value area is the area above and below that VPOC that contains 1 standard deviation (68.2%) of the profile’s volume. This is NOT calculated by just 34.1% of volume above and below the VPOC, but is calculated by looking at each level above and below the VPOC and adding it to the Value area if it is greater than the other. I’ll cover this in more detail in a later post. 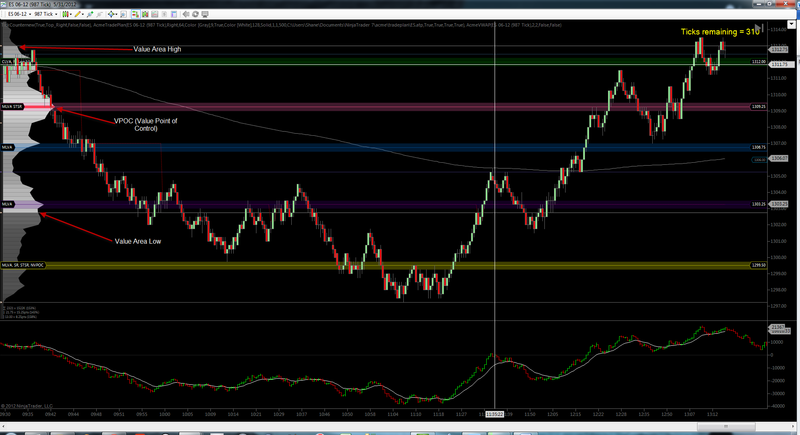 Value Area High: This is the price for the top of the value area. Value Area Low: This is the price for the bottom of the value area. Initial Balance: Is the profile for the first hour of trading after the market opens. Many people believe this profile sets the stage for the rest of the day. Range Extension: Occurs when volume after the initial balance extends the profile in either direction. Later on, I’ll look at more in depth topics like profile shapes and what they mean, composite analysis, and Value Area and VPOC movement.